It was lovely and sunny at the weekend we had our first BBQ of the season. My outdoor space is a small town garden, in which I love to sit out and chill in the summer. 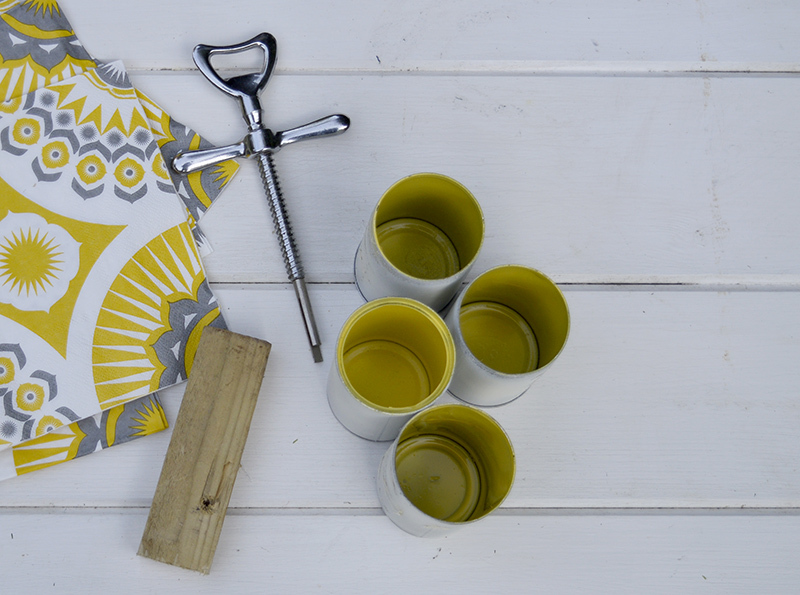 I’m always looking for ways to jazz it up a bit with a few upcycled accessories. A few weeks ago I upcycled an old window into a gorgeous herb planter for my garden. 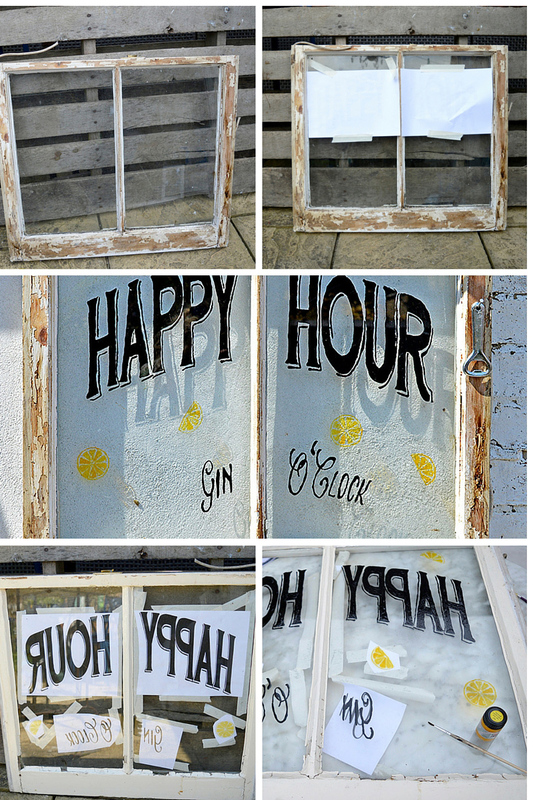 I loved it so much that I decided to make another upcycled window. 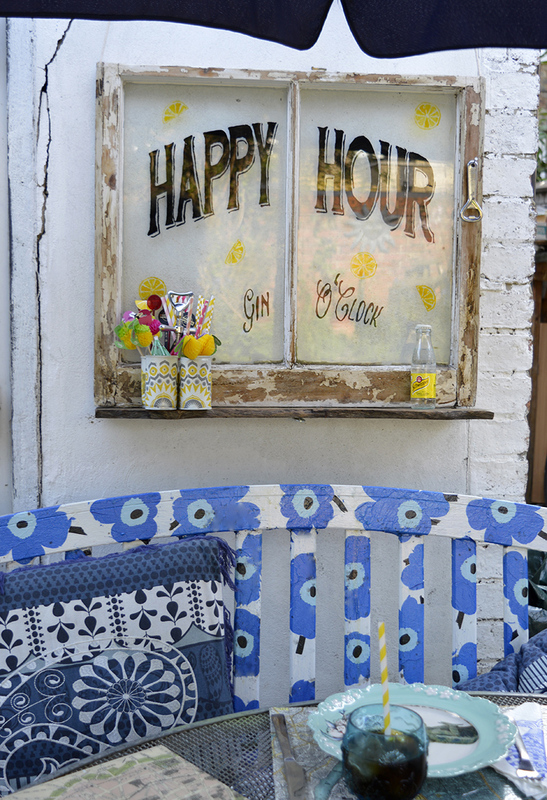 As one of my favourite summer activities is to sip cocktails in the garden with friends, I gave the window a cocktail themed makeover. 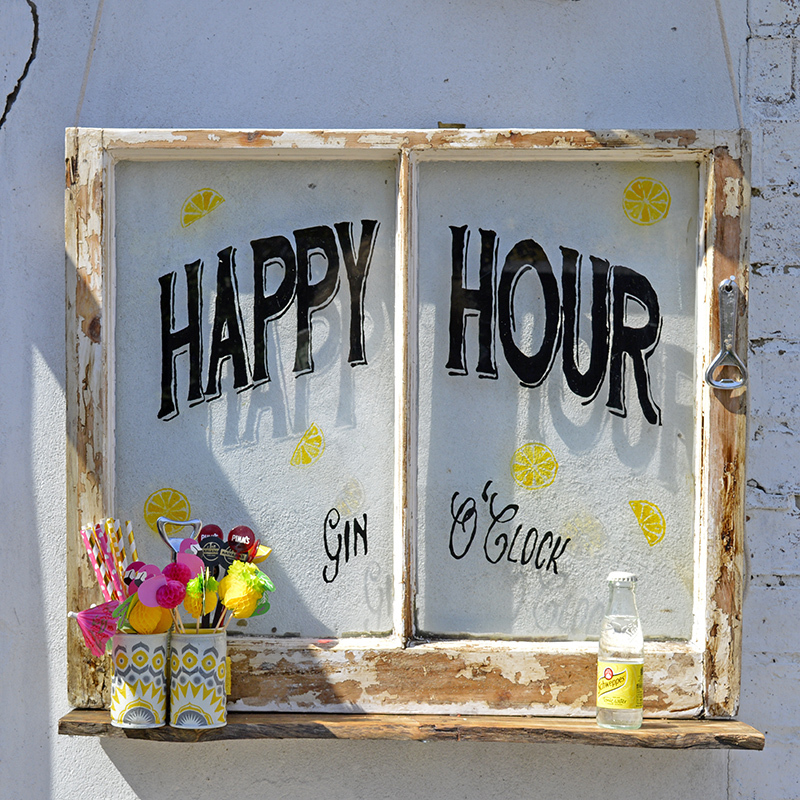 I painted a HAPPY HOUR sign on the window, added a hook for a bottle opener and a shelf to hold a cocktail caddy. You can download for free my sign template and I will show you how I made the little cocktail caddy. This post contains amazon affiliate links for your convenience. Click here to see my disclosure policy. The way I painted the window was basically the same as with my herb planter window but with at different template of course ! 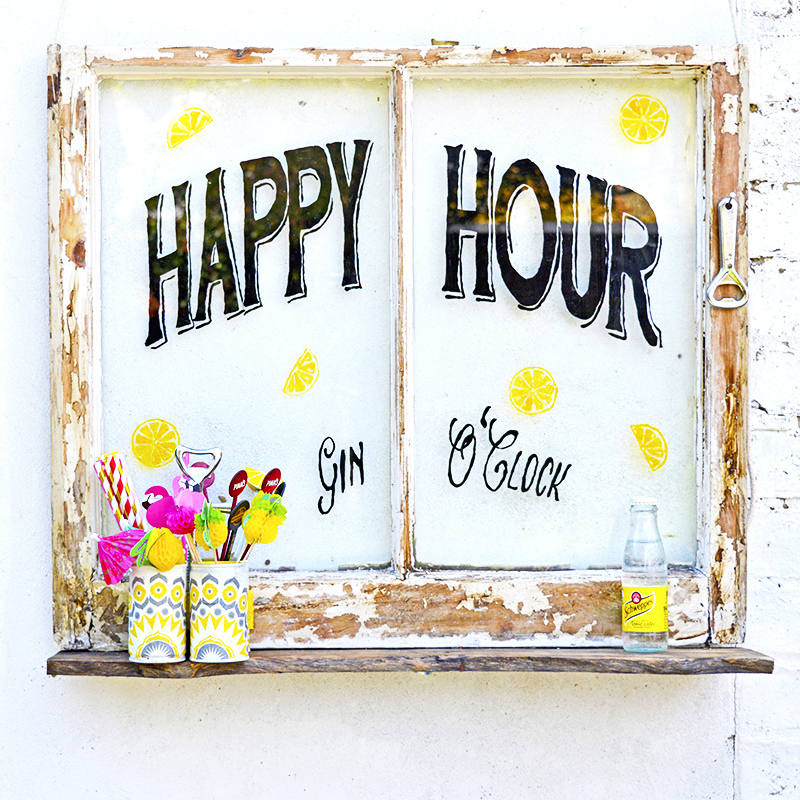 Click here to download the HAPPY HOUR template complete with lemon slices and Gin O’Clock. When you go print your template out, check the box to print a mirror image. Stick your template face down on the front of your window as you will be painting on the back of the window (hence the mirror image). I used glass paints in black and yellow for this window. 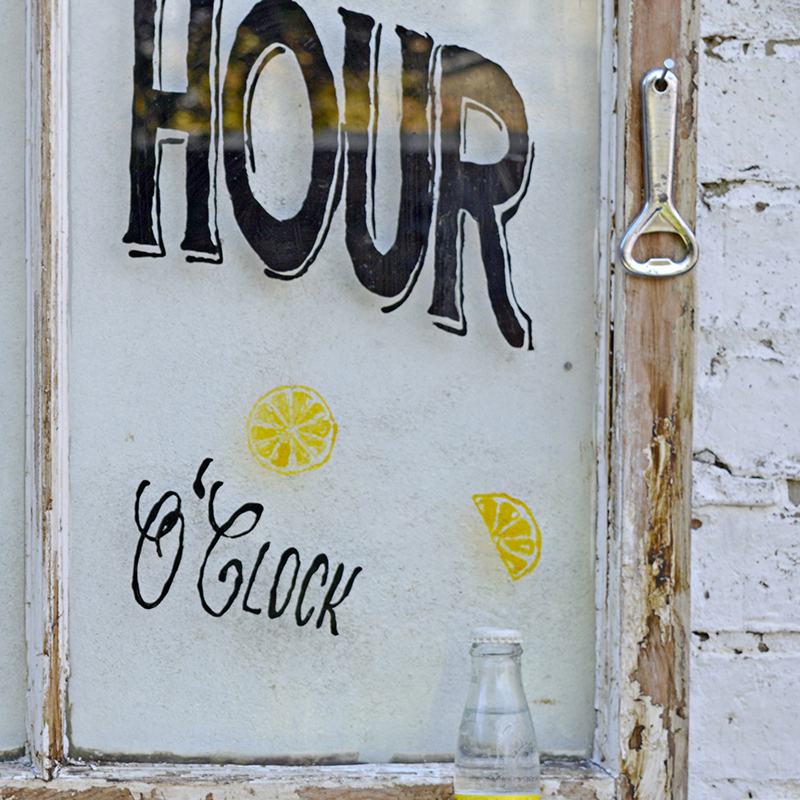 To add a bit more character to the upcycled window, I added a shelf and a nail from which to hang a bottle opener from. I spotted a piece of pallet wood with a nice curve in it. I removed this from the pallet and cut it to the width of the window. The wood was then sanded and waxed with a dark wax before screwing to the bottom of the window. If you want to see a good tutorial for dismantling pallets click her to see Donna’s from Funky Junk Interiors. Being in the upcycling zone I decided to accessorize my window further with a cute little cocktail caddy. I’d made a Copper Craft Caddy before, this was quite similar but this time I used little tins and decoupaged them. You need 4 little tins, like the ones you get coconut milk or tomato puree in. Something for a handle. In keeping with the theme I used a broken bottle opener. A small scrap piece of wood. 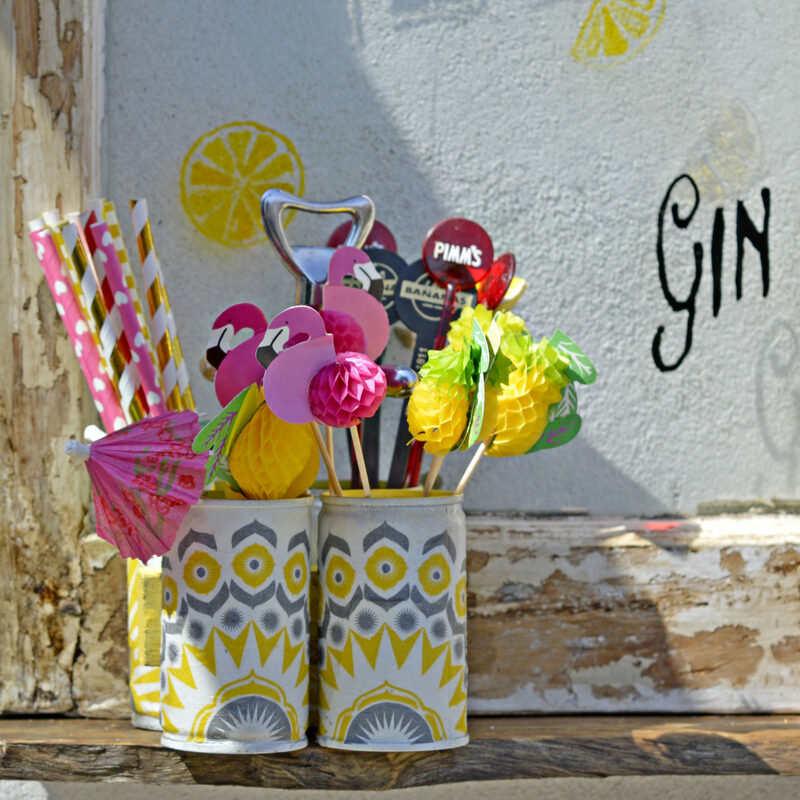 First decorate your tin cans, to keep with the cocktail lemon theme. I spray painted them on the inside yellow and creamy white on the outside. Once dry I then decoupaged the outside with napkins. You just use the top ply layer of the paper napkin when decoupaging. If you want to see more detailed instructions on decoupaging with napkins click here. When finished coat with varnish to protect. To make the handle, I drilled a hole into my piece of wood and stuck the end of my broken bottle opener. You can use resin glue in the hole to secure if needed. Final I stuck the cans, 2 on each side to the wood strip and handle using Epoxy glue. Now your caddy is ready to fill with all your cocktail paraphernalia, such as straws, cocktail sticks and those cute tiny umbrellas. I’ve already been making good use of my cocktail window, I hope this gorgeous weather we are having at the moment continues. I’m looking forward to the elderflowers coming out so that I can make my elderflower champagne which I love to use as a base in a my summer cocktails. As you can probably gather from the window my favourite spirit is Gin so alot my cocktails are gin based such as my Gin & Rhubarb Fizz. What’s your favourite cocktail ? It sure makes me happy looking at it. Thank you it does brighten up my back patio. Cute project, shows lots and lots of talent! Thanks for sharing your post with us at Creatively Crafty #CCBG . DIY Herb Boxes, Tulip Crates, Superman Pillows + More! I love this! The ledge for the caddy is a great addition. Pinning and sharing on FB. Thanks for linking up with Merry Monday! Thank you very much and thanks for the share ! Cheers Claire! 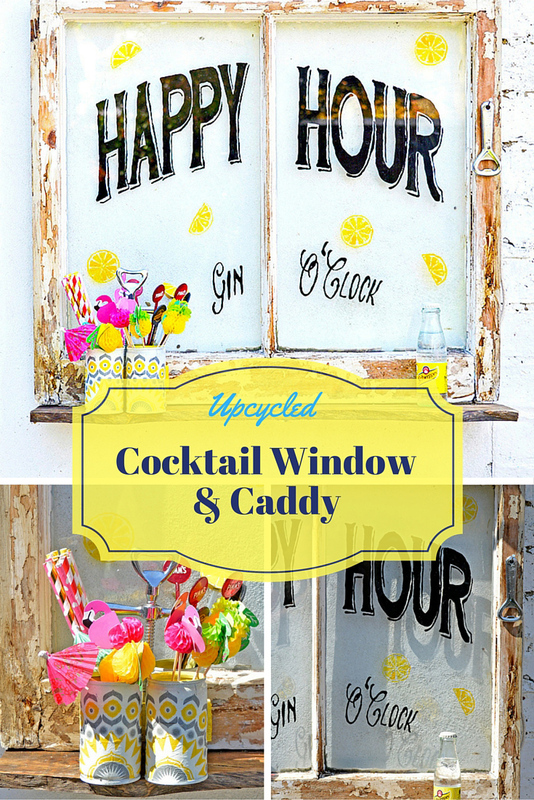 I love your cocktail window and yellow caddy… great projects! Thank you for sharing on Talk of the Town Link party. You are my pick for this weeks features. Lovely to hear I’m your pick this week, cheers and thank you ! Oh how fun! I love this window and the caddy is too cute, too! Thanks for sharing at the Submarine Sunday Link Party! Thank you ! It does add cheer to the garden. I’m slowly getting our deck ready for the warm weather and I love your window crafts. I also love your Elderflower Champagne recipe! Thank you for linking up again at Celebrate Your Story. Thank you can’t wait to make this seasons batch. Love your cocktail window Claire. It’s so fun! Awesome cocktail caddy too! Thanks so much for sharing at Vintage Charm. Thank you and cheers ! 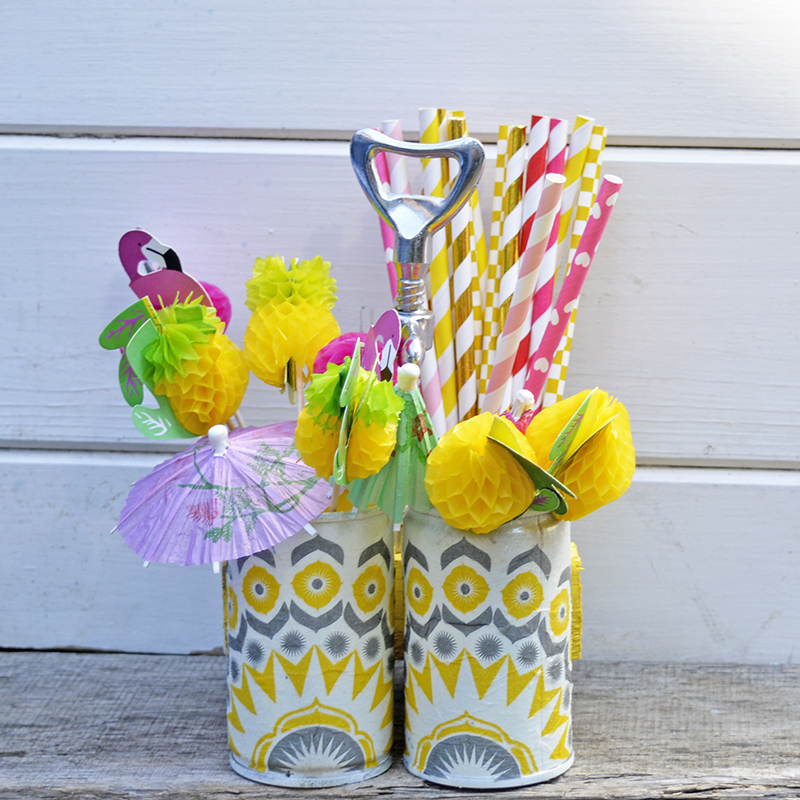 Such a cute project…so creative and fun! So glad you shared at DI&DI. 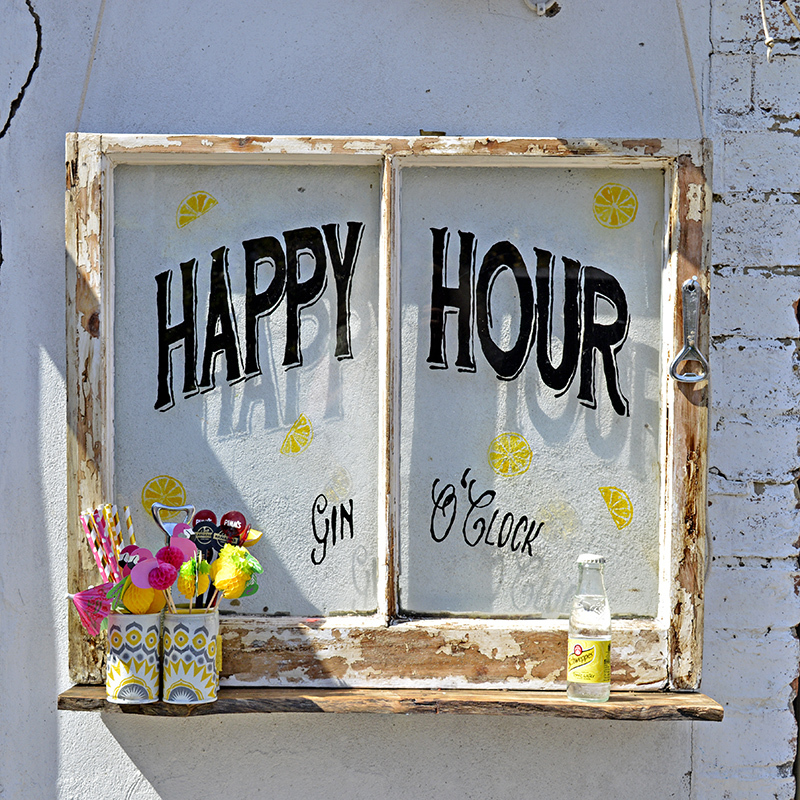 Oh my favorite time of day….gin o’clock! 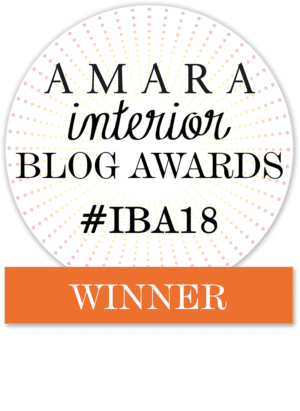 Thank you so much for linking up to Thoughts of Home on Thursday. You make our gathering a happier place. Cheers and thank you ! p.s. Now that it’s warmer, Proseco or Pimms on the deck is just fine! Thank you very much ! I do like a Pimms in the summer ! Oh this is so cute. I love how you personalized it for your space. The added touches are charming. Yay! For up cycling !!! Thank you ! It has brightened up my garden where I like to sip cocktails, unfortunately the weather has turned. I just need that to brighten up too ! Thanks for joining Thoughts of Home. So cute! Great job…. I love all of the fun and festive colors.